Wire Rope Handling And Installation - Elite Sales Inc.
For all wire rope, the best time to begin taking appropriate care and handling measures, is immediately upon receiving it. On arrival, the rope should be carefully checked to make certain that the delivered product matches the description on tags, requisition forms, packing slips, purchase order and invoice. After these necessary preliminary checks, the next concern is that of providing weather-proof storage space. If wire rope is to be kept unused for a considerable time, it must be protected from the elements. The ideal storage area is, a dry, well-ventilated building or shed. Avoid closed, unheated, tightly sealed buildings or enclosures because condensation will form when warm, moist outside (ambient) air envelops the colder rope. Although wire rope is protected by a lubricant, this is not totally effective since condensation can still occur within the small interstices between strands and wires, thereby causing corrosion problems. On the other hand, if the delivery site conditions preclude storage in an inside space nad the rope must be kept outdoors, it should be effectively covered with a waterproof material. Moreover, weeds and tall grass, in the assigned storage area, should be cut away; the reel itself should be placed on an elevated platform that will keep it from direct contact with the ground. Providing an adequate covering for the reel also prevents the original lubricant from drying out and thereby losing its protection. Never store wire rope in areas subject to elevated temperatures. Dust and grit, or chemically laden atmospheres, are also to be avoided. Although lubricant applied at the factory offers some degree of protection, every normal precautionary measure should be taken with every coul or reel of wire rope. If the wire rope is to be kept inactive for an extended period while wound on hte drum of the idle equipment, it may be necessary to apply a coating of lubricant to each layer as the rope is wound on the drum. Cleaning, inspection and re-lubrication should precede start-up of the equipment. It is most important to check the diameter of the delivered rope before installation. This is to make certain that the rope diameter meets the specified requirements for the given machine or equipment. With an undersize diameter rope, stresses will be higher than designed for and the probbability of breaking the rope will be increased; an oversize diameter rope will wear out prematurely. 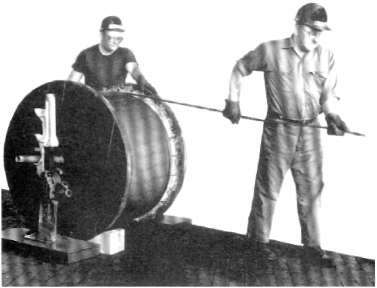 This happens because of abuse to the rope caused by pinching in the grooves of the sheave and drum. In checking, however, the actual rope diameter must be measured. And this is defined as the diameter of the circumscribing circle, i.e., its largest cross-sectional dimension. To insure accuracy this measurement should be made with a wire rope caliper using the correct method (b) shown in Fig. 2. For measuring ropes with an odd number of outer strands, special techniques must be employed. Design specifications for wire rope are such that the diameter is slightly larger than the nominal size, according to the allowable tolerances shown in Table 1. * These limits have been adopted by the Wire Rope Technical Board (WRTB). In the case of certain special purpose ropes, such as aircraft cables and elevator ropes, each has specific requirements. If a quiestion should arise regarding compliance with oversize tolerances, the eope may be measured under tension of not less than 10% nor more than 20% of the nominal strength. Fig. 2: How to measure (or caliper) a wire rope correctly. Since the “true” diameter (A) lies within the circumscribed circle, always measure the larger dimension (B). Wire rope is shipped incut lenghts, either in coils or on reels. Great care should be taken when the rope is removed from the shipping package since it can be permanently damaged by improper unreeling or uncoiling. Looping the rope over the head of the reel or pulling the rope off a coil while it is lying on the ground, will create loops in hte line. Pulling on a loop will, at the very least, produce imbalance in the rope and may result in open or closed kinks (Fig. 3). Once a rope is kinked, the damage is permanent. To correct this condition, the kink must be cut out, and the shortened pieces used for some other purpose. Fig. 3: Improper handling can create open (a) or dosed kinks (b). The open link will open the rope lay; the closed kink will close it. Fig. 3: The wire rope reel is mounted on a shaft supported by jacks. This permits the reel to rotate freely, and the rope can be unwound either manually or be a powered mechanism. 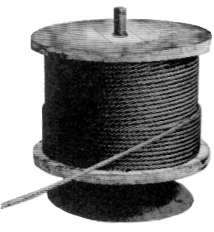 When re-reeling wire rope from a horizontally supported reel to a drum it is preferable for the rope to travel from the top of the reel to the top of the drum; or, from the bottom of the reel to the bottom of the drum (Fig. 5). Re-reeling in this manner will avoid putting a reverse bend is induced, it may cause the rope to become “twisty” and, consequently, harder to handle. When unwinding wire rope from a coil, there are two suggested methods for carrying out this procedure in a proper manner: 1) One method involves placing the coil on a vertical unreeling stand. The stand consists of a base with a fixed vertical shaft. On this shaft there is a “swift,” consisting of a plate with a inclined pins positioned so that the coil may be placed over them. The whole swift and coil then rotate as the rope is pulled off. This method is particularly effective when the rope is to be wound on a drum. 2) The most common as well as the easiest uncoiling method is merely to hold one end of the rope while rolling the coil along the ground like a hoop (Fig. 6). Figures 7 and 8 show unreeling and uncoiling methods that are most likely to cause kinks. Such improper procedures should definitely be avoided in order to prevent the occurrence of loops. These loops, when pulled taut, will inevitably result in kinks. No matter how a kink develops, it will damage strands and wires, and the kinked section must be cut out. Proper and careful handling will keep the wire rope free from kinks. (b) Wrong Fig. 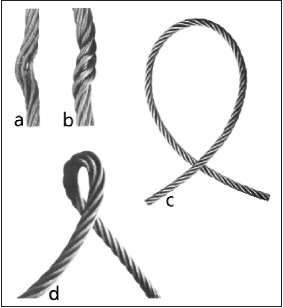 5: The correct (a) and the wrong (b) way to wind wire rope from reel to drum. Fig. 6: Perhaps the most common and easiest uncoiling method is to hold one end of the rope while the coil is rolled along the ground. Fig. 7: Illustrating a wrong method of unreeling wire rope. Fig. 8: Illustrating a wrong method of uncoiling wire rope. Inspect products regularly for visible damage, cracks, wear, elongation, rust, etc. Protect all products from corrosion. The need for periodic inspections cannot be overemphasized. No product can keep operating at its rated capacity indefinitely. Periodic inspections help determine when to replace a product and reduce rigging hazards. Keep inspection records to help pinpoint problems and to ensure periodic inspection intervals. Due to the diversity of the products involved and uses to which they can be put, it would be counterproductive to make blank recommendations for inspection procedures and frequency. Best results will be achieved when qualified personnel base the decision on information from rigging and engineering manuals and on experience from actual use in the field. Frequency of inspection will depend on environmental conditions, application, storage of product prior to use, frequency of use, etc. When in doubt, inspect products prior to each use. Carefully check each item for wear, deformation, cracks or elongation, a sure sign of imminent failure. Immediately withdraw such items from service. Rust damage is another potential hazard. When in doubt about the extent of corrosion or other damage, withdraw the item from service. Additional warning and information on the wire rope, chain, cordage, blocks and tools can be found preceding each section. These should be read and understood thoroughly before using a particular item.